I was so lucky in a game over on the Facebook page of Sheepski Designs and I won this darling image! I won in the very next game, also, and another digi was my prize. You'll see that one in a day or two. where they want to see tall and skinny cards. to make the envelope myself. While it doesn't show really well in the photo, this is a lapped, gatefold card. The left flap is wider than the one on the right (but narrower than the overall width of the card) and the right flap tucks inside, under the left flap. What you see as a colored strip on the right side is actually the outside edge of the right flap. 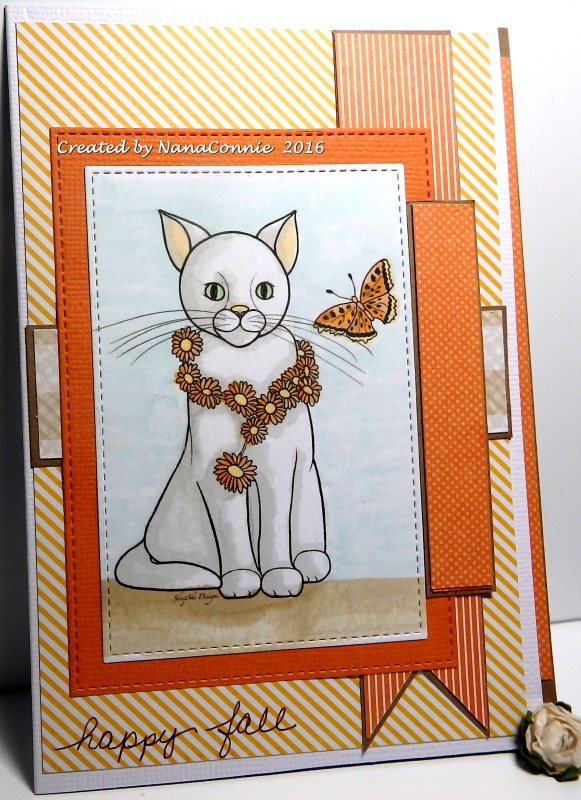 I colored that darling cat with my ProMarkers, then cut him with one of my stitched rectangle dies from Die-namics. I cut another piece with the next size larger die from that same set and used it to mat the image. All the papers came from different stacks by DCWV and most of those are matted with kraft brown CS. 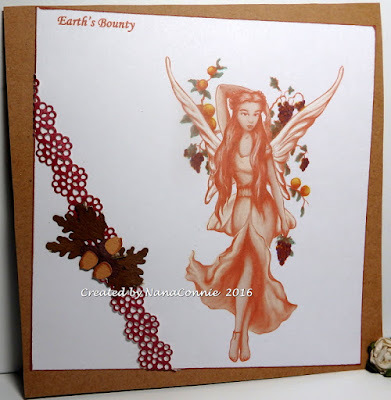 Today I did a card all in wonderful fall sepia tones and it's very different from my normal, inside-the-box, coloring ideas. :-D The image is "Earth Fairy" by Fabrika Fantasy. I used my polychromos pencils again but colored the fruits with my ProMarkers and added highlights to her wings with a white gel pen. I knew I wanted it to be really CAS so I cut the image into a simple but fairly large square, inked the edges, then added it to a kraft card base, tilting it at an angle. I used a scrap of paper lace and added die cut leaves (Die-namites) stacked together, and three tiny, hand-cut acorns to make an autumn embellishment. It's CAS and flat, so it will be easy to mail. 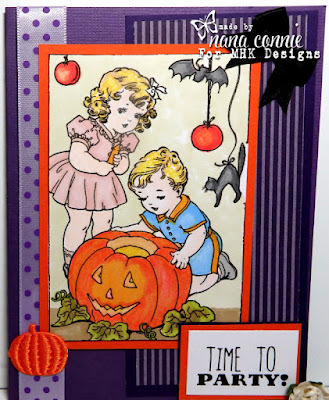 I'm on a Halloween kick this week and have made no Christmas cards for my stash in over 10 days! Pretty bad when I'm going to need at least 2 per week in order to have enough done for my Christmas needs. Ah, well, that just means two weeks with four Christmas cards. 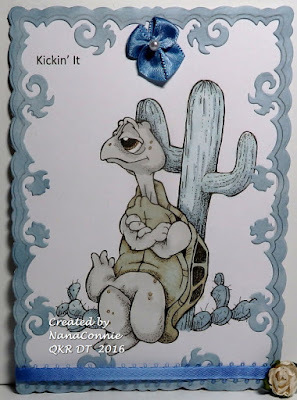 This card uses a silhouette image from Bugaboo Stamps which is one of those fun, fun, fun images. I used ProMarkers to color the sky, the ground, the faces on the pumpkins, and the moon. I put it on a black card base and added the strip of ribbon which was a scrap left on my craft table. I dug out one golden topaz gemstone for embellishment, then left it alone. This card will have to be mailed so flatter is better. I'm working with my new poly pencils again and, while I've gotten better at shading and highlighting, I can't seem to get away from a pastel look with my coloring. More practice needed, obviously. Her hair looks bluish in the photo but IRL, it's gray-green and her face is a pasty, witch-y, yellow-green. My camera lens has a mind of its own! The image is fussy cut and mounted onto a black pumpkin doily from Recollections. I added that to an orange, die cut, doily (Cheery Lynn), then put everything onto a warm gray card base. The only embellishment I added was the black, satin ribbon, bow. This is my second post today. 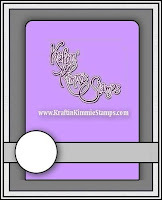 If you're looking for my QKR Stampede DT card, click HERE. 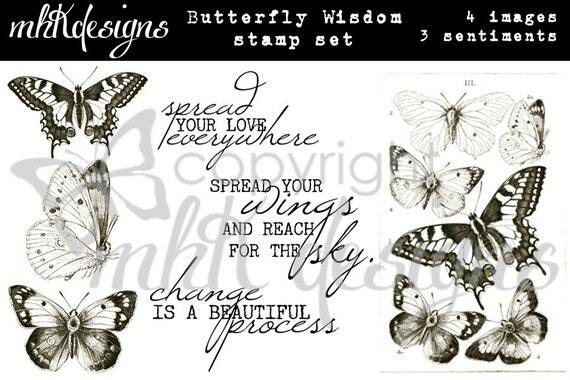 Well, by now you've had a chance to see all the new releases for this month at MHK Designs and to check out the latest challenge inspiration photo so today I want to give you another way to be inspired by another of the images in the "Thankful Thoughts" set. 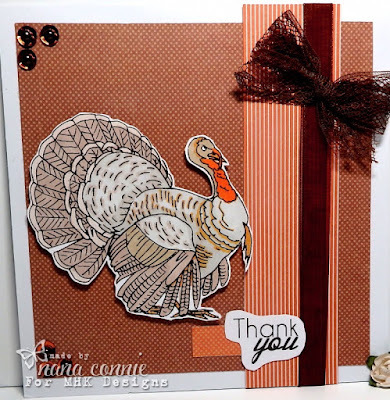 I used the cornucopia image last week and now this is the fabulous turkey. I made a plain Thank You card but it could just as well have been a masculine birthday. It would definitely make a great Thanksgiving card. I wanted to stick with monochromatic, fall neutrals but no matter what I did photographically, all the light browns in the dp turned to rust. Hmmm, don't know how to correct that so you'll have to trust me that they are more brown and less rust than they look here. I colored with polychromos pencils but used ProMarker on his wattle for a deeper color. I fussy cut the turkey and mounted him on dimensional tape. I used satin lace to make the bow and the ribbon is velveteen. The corners are decorated with sequins and pearls. I hope we're going to see you playing along in the August/September challenge which runs through until September 20. Remember, if you use an MHK Designs image, then the theme is Anything Goes and you don't need to use the inspiration photo at all. 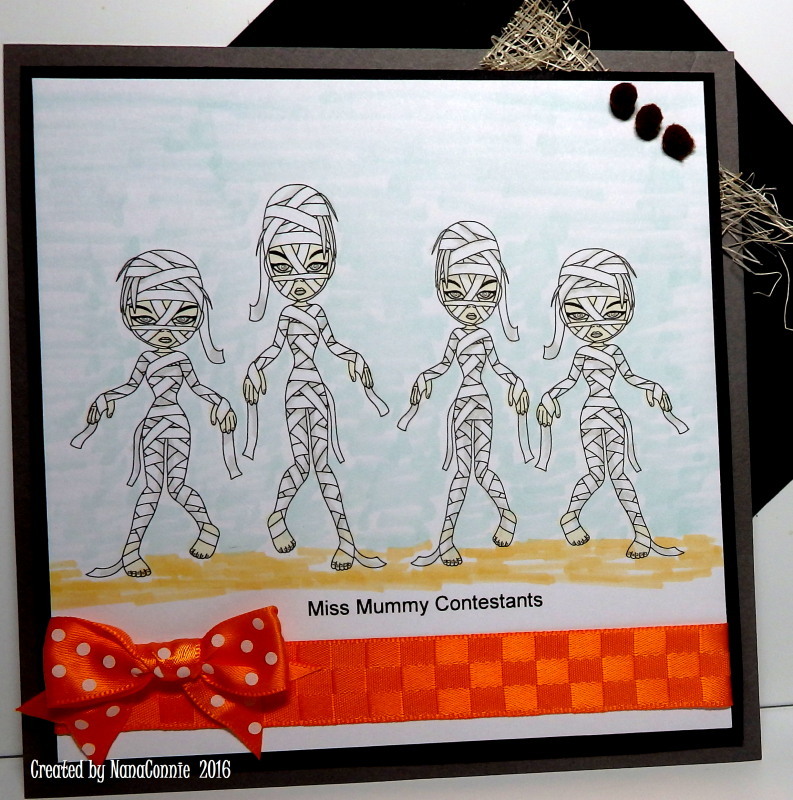 :-D You can find the challenge on the main MHK Designs page by clicking on the tab at the top which says "Current Challenge." I've returned to using my ProMarkers to color, then I fussy cut the image and layered it with dimensional dots on top of a stitched, scalloped circle, die cut. I also used another die cut of circles in the background. Both die sets are from Memory Box. The polka dot "bowtie" was added for embellishment but after that I left it alone. I wanted a masculine card and it just didn't need any further embellishment. I was over browsing around the Ching-Chou Kuik blog, then strolled over to their Etsy shop and found this image which jumped in my cart without even asking! lol I brought it home and made this early autumn card. The image is printed directly onto the card front. 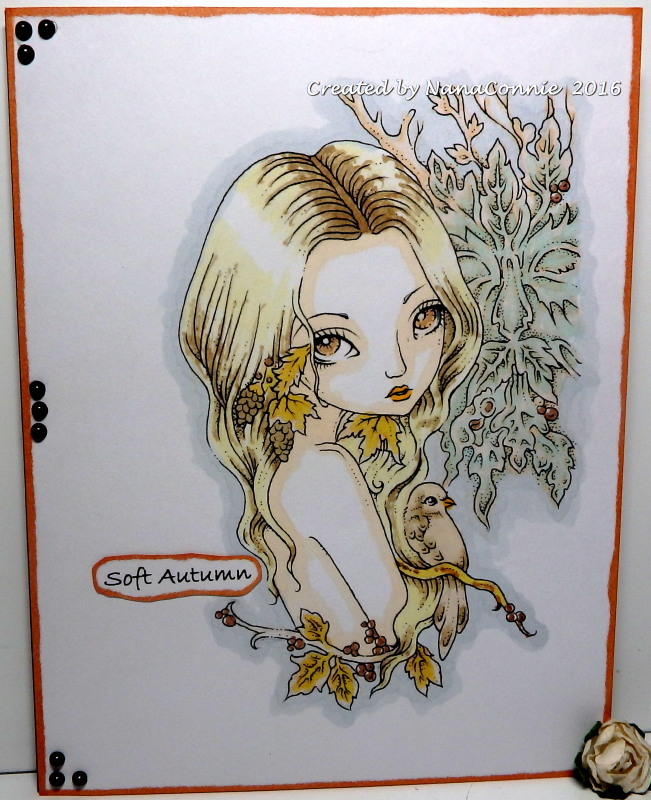 I colored her with my ProMarkers, then inked the edges of the card front to give it a bit of a frame. I printed the sentiment, hand cut it and inked the edges of it. I added the dark brown pearls and decided it was finished. A nicely CAS design. 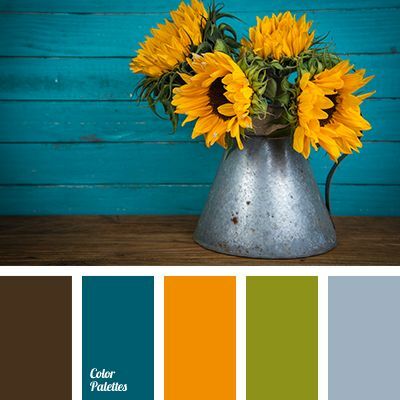 and colors came from the challenge at DRS Designs. I colored with my ProMarkers again since I'm more comfortable shading and adding highlights with them than with my new pencils. I die cut it with one of my very first dies, from a Spellbinders set, I think, but since the packaging was tossed out long ago, I can't be sure. I trimmed one corner just for a different effect. I matted it with sparkle CS in both light blue and darker blue, rounding the corners of the darker blue with a hand punch before mounting that onto kraft CS which was also cut with another die from that same set. I put everything onto a dark brown card blank. The striped ribbon was a scrap in my stash and I added fabric and mulberry paper flowers to the bow. I had so much fun making this card ! Each mummy is the exact same image but I flipped some of them and adjusted the size to get the row of beauties participating in the contest. It's amazing what can be done with digital images. :-D Of course, I'm going to use this as a Halloween card. and the sketch is from Kraftin' Kimmie. I used my ProMarkers to color the image (freebie from Scrapper's Delights for their FB Progressive Challenge) and the background. The sentiment was printed at the same time I printed the image. I added the ribbon (which is actually deep, apricot gold, not orange! It matches the sand color in the image) before I matted it with black CS. That entire piece is adhered with Pop Dots. I added the polka dot bow (also not orange!) and slipped a piece of torn cheesecloth behind the upper corner, then added the three embellie dots to the top corner. 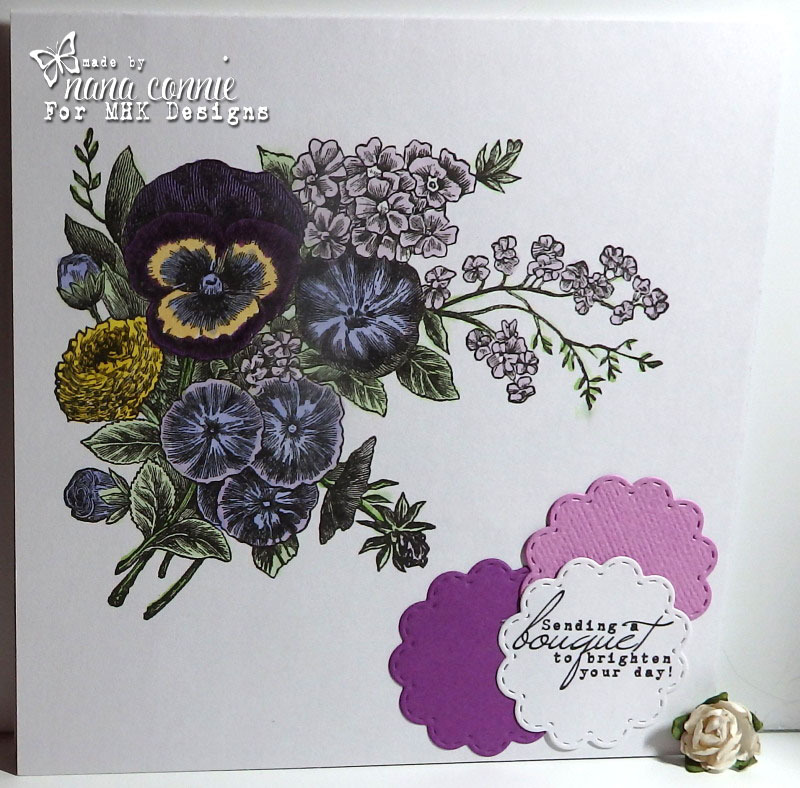 Those are teeny pom poms so they give the card some great texture, as well as visual interest. Here's my DT card and I was definitely influenced by the colors in the inspiration photo. I'm really into my new polychromos pencils this last week and, while I will return to my ProMarkers for most of my coloring, I'm still practicing and learning about these pencils. They're different from the watercolor pencils and Gamsol I've used before and it takes some time to figure out how to blend and shade the colors. On this image, I didn't do much of either of those, preferring to have something that looked more vintage. I wanted it to look like it was a hand-colored illustration plate in a book from the late 1800s. I cut the image with a rectangle die and then punched the corners. The doily was cut with a die from Spellbinders. I cut two different colors of CS and inlaid the butterflies from one cut into the doily from the second cut to get the contrasting colors. I then added three of the butterflies from the lavender CS cut to the upper corner and decorated them with pearls. They made me think about adding black pearls to the butterflies inlaid into the doily so I went back and did those. 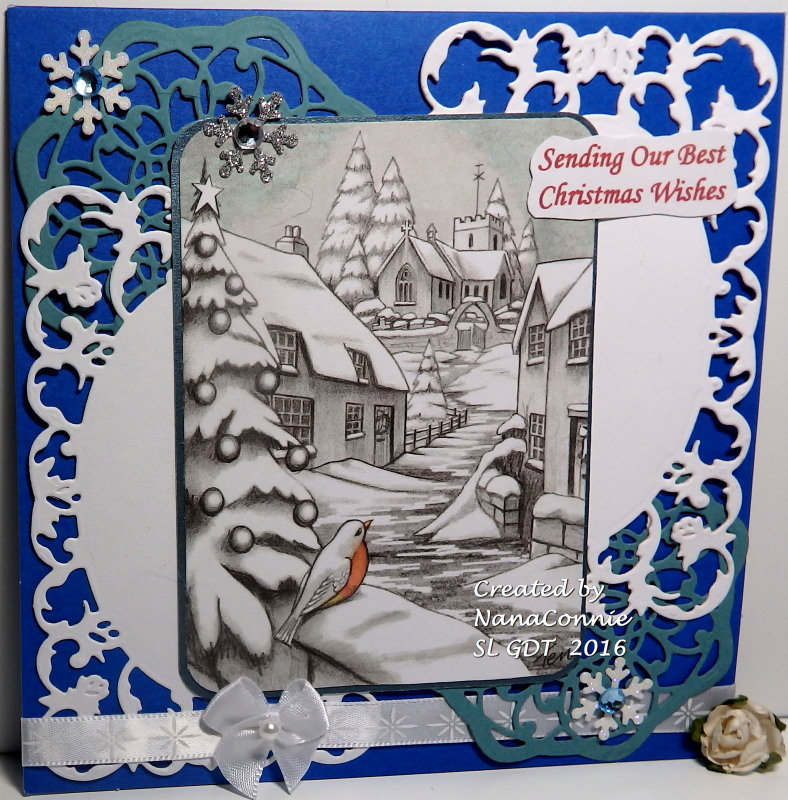 The lace enhanced the vintage charm of the card and it was a scrap from my stash which was begging to be used. Now, I want to show you the inside of the card. Since it was made with a black cardstock base, it would be very difficult to write anything inside. 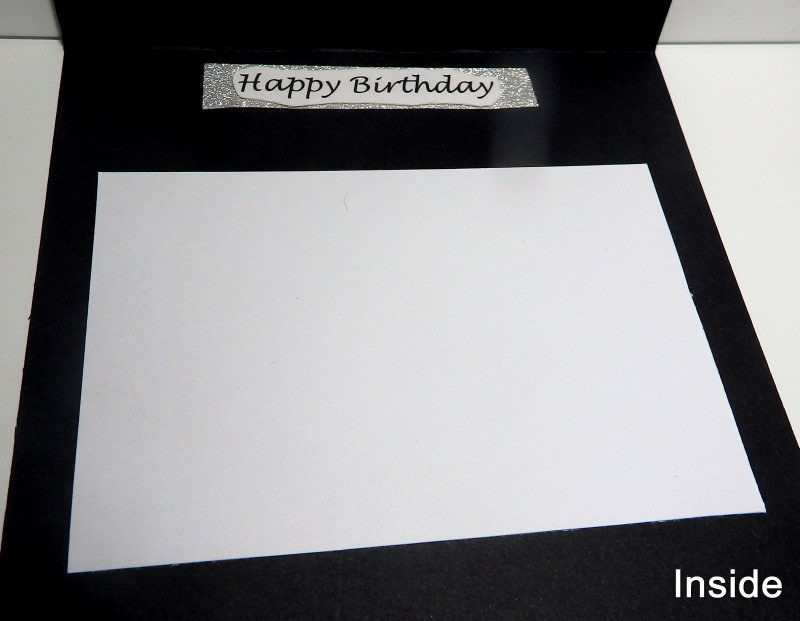 I put the sentiment inside and added a square of white CS on which a personal note can be added. The 'Happy Birthday' sentiment is matted with glittery silver CS and, boy! does it sparkle IRL! 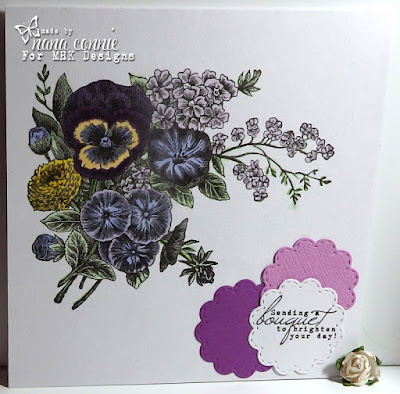 Here's the fifth and last set in this August release from MHK Designs and I can't tell you how much I love the gorgeous pansies in "Pansy Corner." You can see a photo of the complete set at the bottom of this post. For now, here's a card showcasing the image and one of the sentiments. This time I used my new Lyra pencils to color the image because I wanted a very soft-looking pallette. 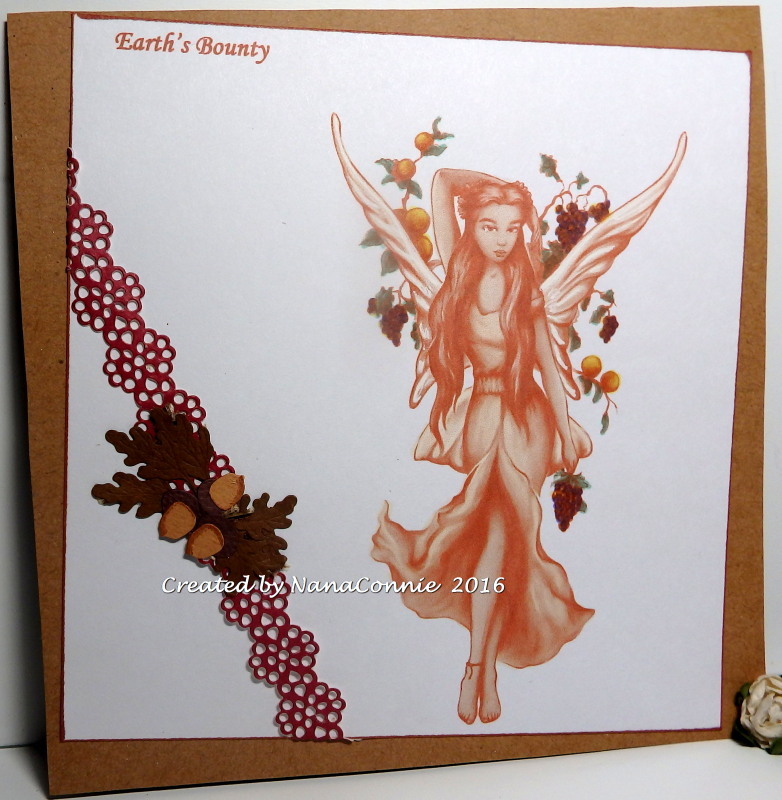 The image is printed right onto the card front and that means another really CAS design. 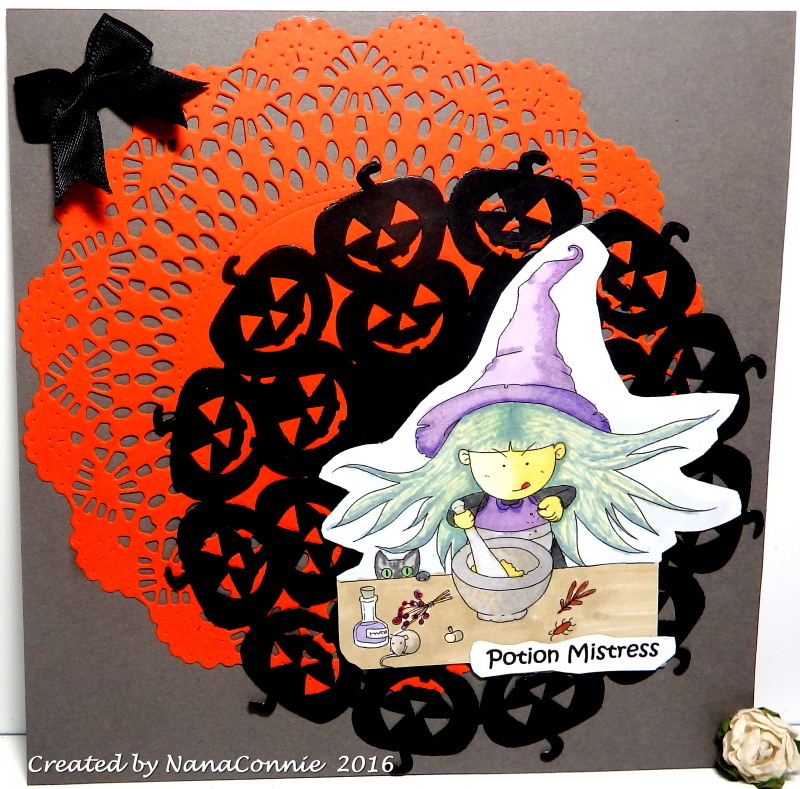 Another fabulous release from MHK Designs this month and now we have a delightful Halloween set, called "Halloween Party." A photo of the complete set is at the bottom of this post. 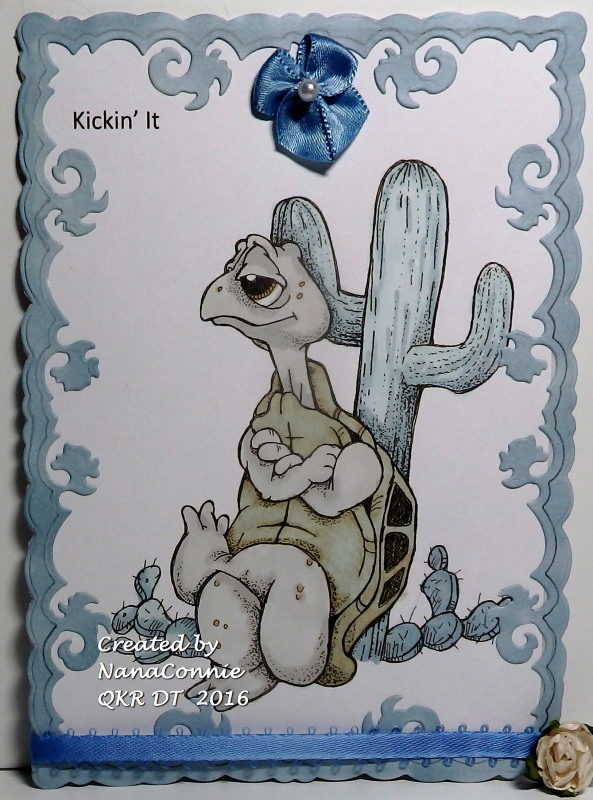 Here's my card showcasing the image and one of the sentiments. I think this one will be perfect for party invitations. 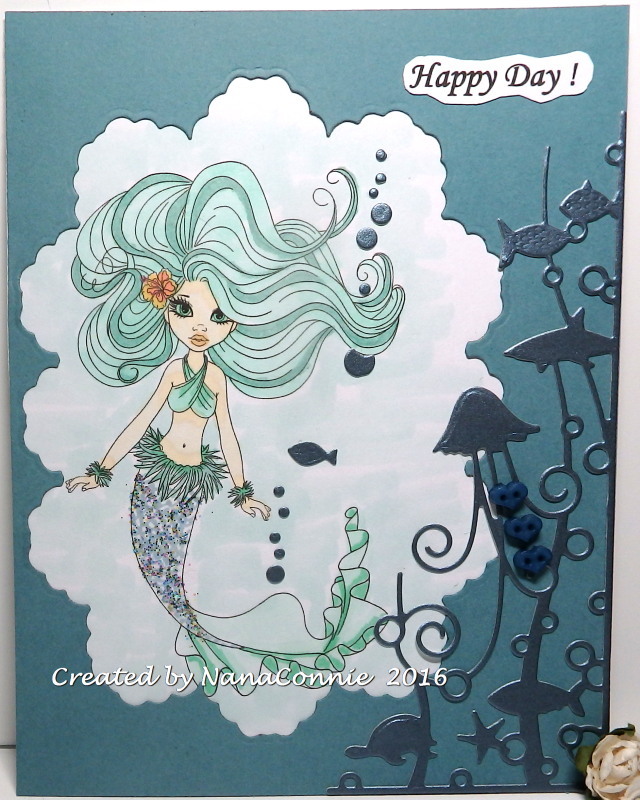 I colored the image with my ProMarkers and cut it with a rectangle die from Spellbinders. 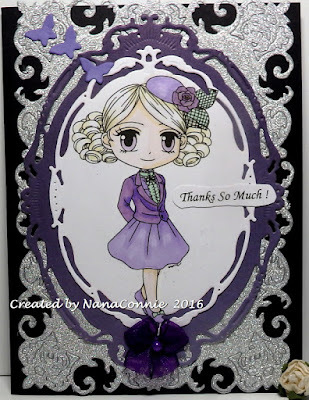 I added a rectangle mat and then cut and double matted the sentiment, also using rectangle dies but this time from QuicKutz. I thought a Halloween card was a perfect opportunity to use up some of my favorite-color-purple scraps of CS and dp. I love purple so much, I find it very difficult to throw out any scrap of paper that has purple on it so I'm always thrilled when I can find a use for some of those scraps. The polka dot ribbon is also a scrap from my stash. 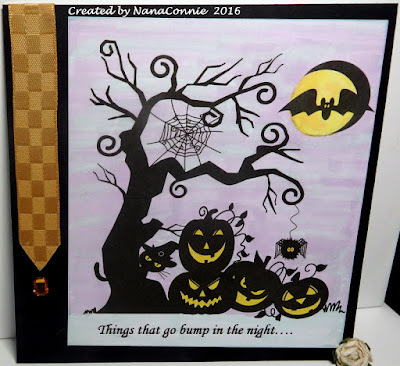 I tied a black bow and added the fabric pumpkin for my embellishments. I don't do shaped cards very often because I only have a few dies which lend themselves to card shapes but for today's card, I cut the card by hand to loosely fit the shape of the birdhouse image. 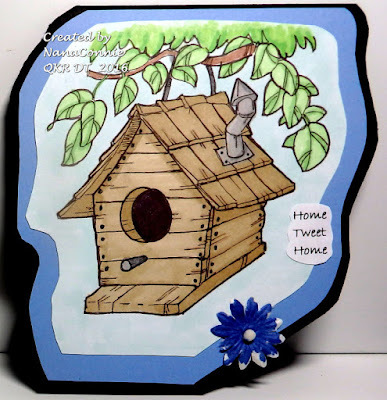 It comes from QKR Stampede (Digi 23601 "Birdhouse") and today starts our latest weekly challenge with a theme of "Shaped Cards." I colored the image with my brand new, never-before-had, Lyra Rembrandt Polychromos colored pencils. OK, so I have quite a bit to learn about blending polychromos pencils and maybe even about color selections but I remember back when I was first learning about alcohol markers, and I think I'll get it with more practice. :-D Pencil coloring gives a much softer, more pastel look to the finished product and sometimes, for what I want to do, that's perfect. Everything is hand cut this time and the only embellishment is the one mulberry paper flower. Very CAS design. It fits into a standard square envelope and since I had some black envelopes on hand, I used one of those. Come play with us this week! Designing for Morgan's Art World ! Woohoo! If you had told me that I was going to pick up another DT position, I would have laughed but then I got an invitation from Morgan's ArtWorld and I just couldn't turn it down since I love her artwork so much! I'm honored to be asked and this is my first project as a DT member. 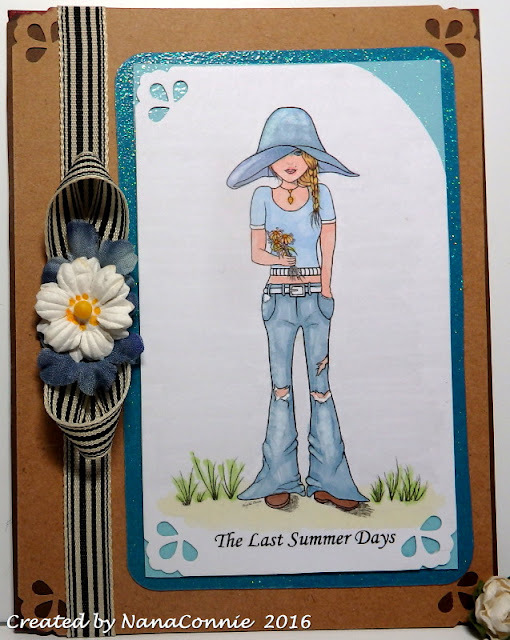 It's for the August 19 challenge which runs for two weeks and our theme is "Anything But a Card." I do mostly cards so sometimes it's difficult for me to switch gears and think in terms of something else but not this time. I had just picked up a new 16 month calendar/planner for the rest of 2016 and all of 2017. It was very plain and just cried out to have something beautiful decorating it. What do you think? 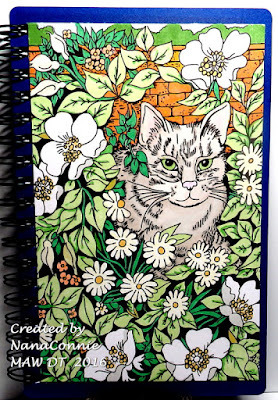 I colored with ProMarkers, trimmed the image to fit the front of the planner book, and was very pleased with the fact that I'll get to look at that from now until the end of 2017. Because I didn't want it to get worn or dirty being slipped in and out of my purse or briefcase, after I photographed it I laminated it. I also tied some ribbons to the top of the spiral binding after I took this photo so there's some texture and I can use them to mark a particular page. It's perfect now! 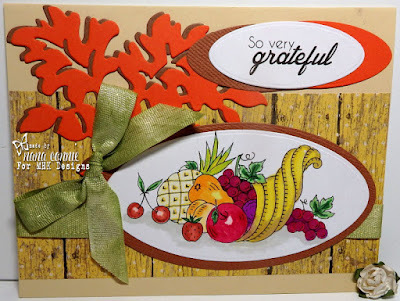 Day Three in the August release from MHK Designs and Mynn has given us a fantastic set perfect for Thanksgiving or any other "thank"ful occasion, including sentiments for simple Thank You cards. We all know we're going to need those over the holidays. :-D You can see a photo of the complete set at the bottom of this post. Here's my card using an image and a sentiment from the "Thankful Thoughts" set. I colored the cornucopia with a combination of ProMarkers and Copics, then die cut it with an oval die from QuicKutz. 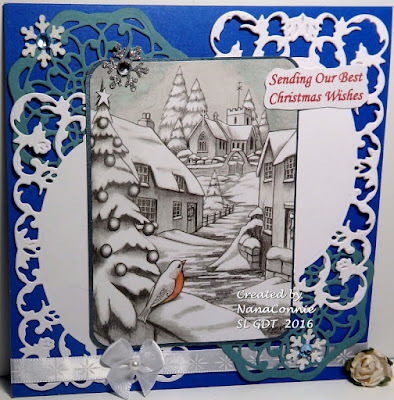 I used oval dies from that same set to cut the mat, the sentiment and the mats for it. I found a die that's been in my collection for a while but which I'd never used and decided this was the perfect card design for it. The leaf die is made by Die-namics. I used it to cut two different colors of CS and then offset them. Both the ribbon and the dp are scraps from my stash. When the title says "Beautiful Bottles," I know some of you are looking for beautiful wine bottles (you know who you are!) but that's not what we have for you today. These are gorgeous vintage bottles from MHK Designs that are so versatile you'll want to have a whole stash of cards made with the bottles from this "Beautiful Bottles" set. You can see a photo of the entire set at the end of this post. 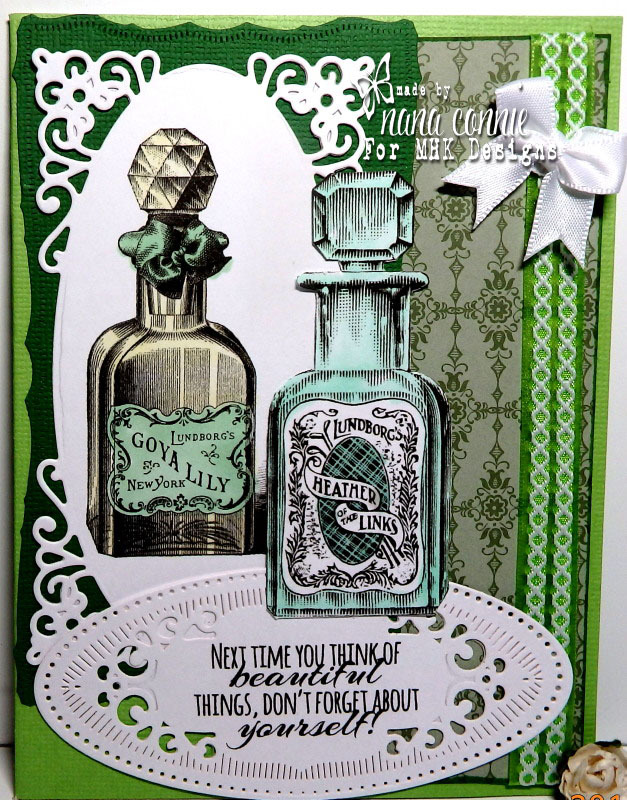 I used two of the bottles from the set for this card and I do believe I went a little crazy with design. Both bottles are colored with my ProMarkers and the front bottle is fussy cut, while the other bottle is cut with a die. The green mat behind it is first embossed with my "Linen" folder and then cut with another die. The sentiment is printed and cut with another die, and all three of those dies are from the same Spellbinders set, "Radiant Rectangles." All of those were cut from various scrap pieces lying on the table. The two bottles, the sentiment, and the mats behind them make up one half of the card front and they are actually layered onto the left side of a gatefold, overlapping the right hand gatefold which has the dp, ribbon strip, and bow. This card was made for my GDT post for the new challenge starting this morning at Scrapy Land where the theme is to "Use an Image" (digi or rubber.) My image is from Delicious Doodles and is called "A Robin's Christmas." Remember, in order to play along, you can use any image by any company but you do have to use at least one die from the more than 40 brands carried in the Scrapy Land store. I colored the image with my ProMarkers, then rounded the corners with a hand punch. I layered on all the die cuts, added the satin ribbon (which has snowflakes in it) and bow, and used glittered snowflakes with gems for embellishment. I printed the sentiment with red ink, picking up the tiny spot of red on the robin's chest. I like this so much, I'm going to do several more like it and donate them to the senior center near me. I do that each year and the cards are so appreciated by the seniors since they can use them for family and friends at Christmas. 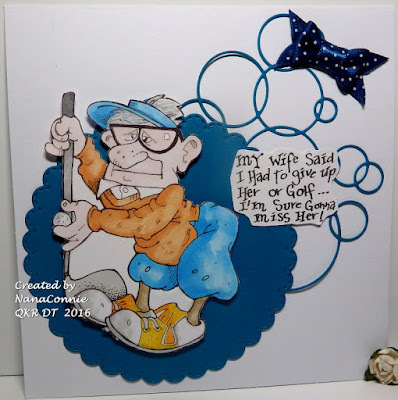 It's so very difficult for them to get out and buy cards and, after seeing me bring cards around the last three years, a few of the ladies now give me ideas for cards they'd like to see. What fun! 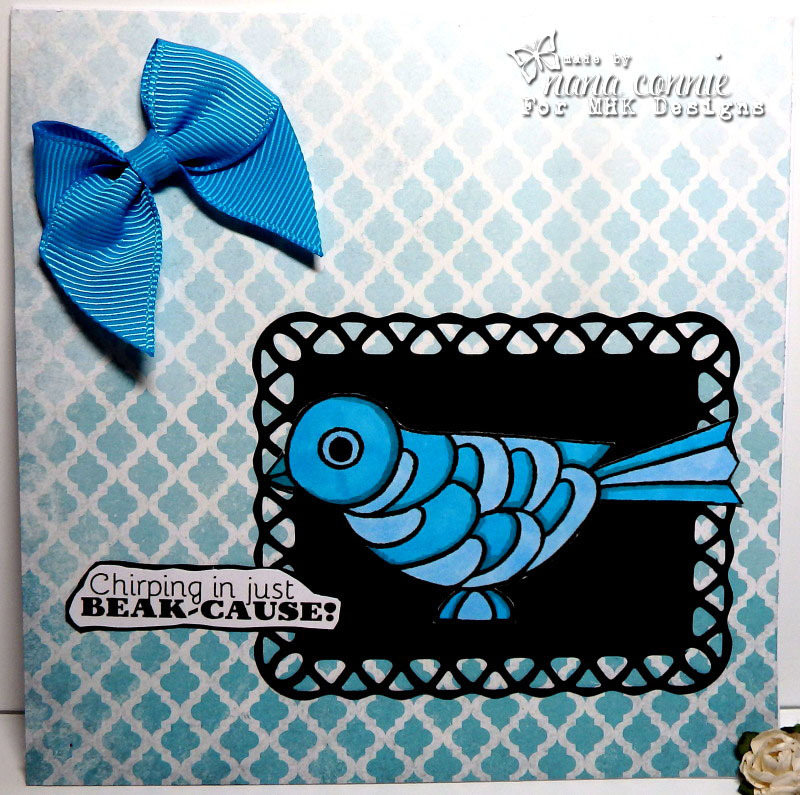 It's the start of five new releases this month at MHK Designs and the first one we want to share is a set with delightful bird designs called "Tweet, Tweet." I chose just one of them for this card but you can see the full set with all the images and sentiments at the bottom of this post. I didn't have a card to post yesterday and I won't have another one until Tuesday because this month has been so busy for me! I'll be away from my computer for several days at the end of the month, too, but I hope you'll bear with me. I have two or three days of double posts this coming week so that should make up for it, right? 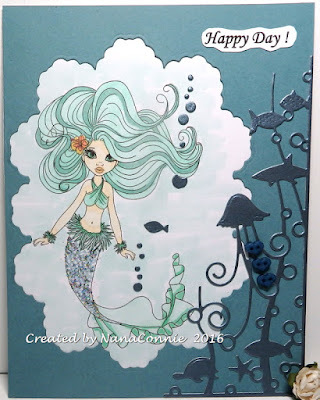 I managed to get this card made early this morning, using the August Progressive Challenge image from the ArtbyMiRan FB page. Isn't she darling? I used her for a Thank You card because my stash of those is getting low. 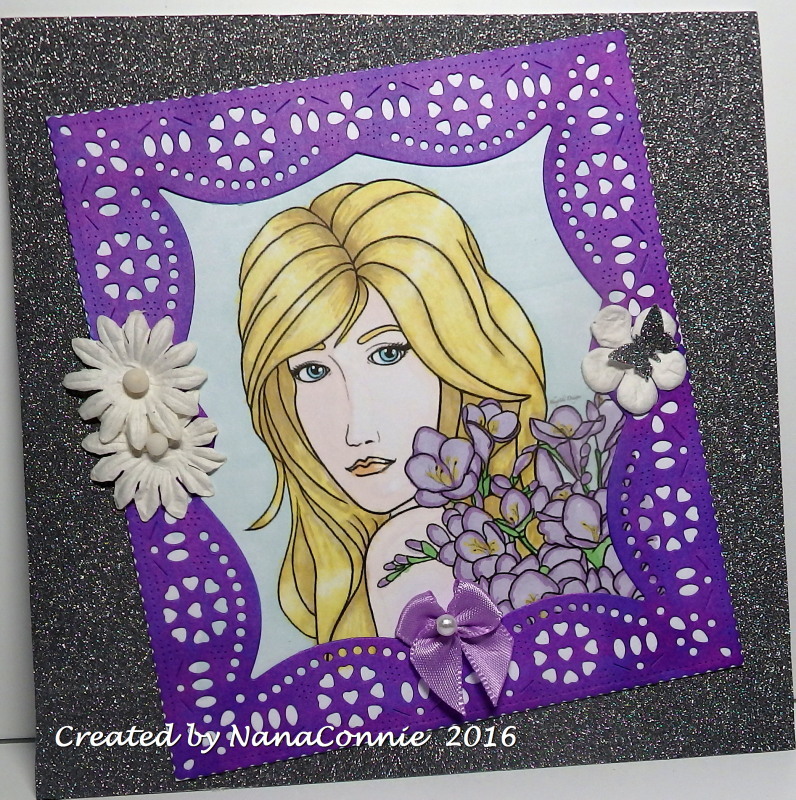 I added the three tiny butterflies in the upper corner and the sheer ribbon bow with the purple pearl at the bottom. Very complex looking but really rather simple and fast to make. I'll be sharing five new releases from MHK Designs this week, starting on Tuesday. Come by and check them out. They're gorgeous! Then on Thursday, in the evening *(my time), I'll have a post with some wonderful news to share. Friday is another new challenge at QKR Stampede and I'll have my DT card for that one. Finally, next Sunday, August 21, the new challenge will begin at MHK Designs but for now you still have time to enter the current one before it closes on Aug. 20. Hope to see you there. Is it Friday morning already? Where did this week go? I woke up on Monday and now it's four days later. 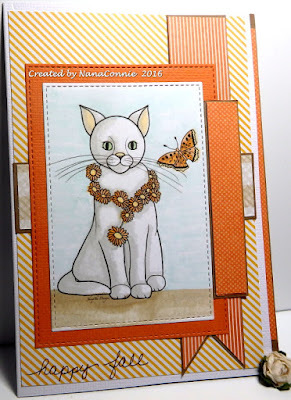 lol OK, well, Friday means a new challenge at QKR Stampede and our theme this week is "Monochromatic" so we want to see cards done in various shades of only one color. Here's mine using Digi 9106 "Relaxing." This is my first image from Cute as a Button but probably not my last. :-D I've just discovered them and I can feel a shopping spree coming on. Oh, well, feeling a shopping spree is more fun than feeling a summer cold coming on! Speaking of summer, what could be better than celebrating a cool day under the sea? I think I'll use this for a birthday card. I colored the image with ProMarkers and chalks, then added a bit of glitter to her hips and upper tail. I used a die from Sue Wilson to cut the piece that frames her. On this card, I cut the blue CS and laid it over the image. On top of that I layered the undersea die cut from Memory Box. I used the little negative circles that dropped out to make the bubbles on the image. The little fish is also a negative piece. I thought that would be a great way to use those tiny scraps instead of just tossing them away. I've been pretty faithful about playing in the monthly progressive challenge at The Outlawz since it started nearly 2 years ago and this month we get to use an image called "August" by Andrea Norris at Sheepski Designs. I have to tell you that every time I look at this image, it brings back memories of my Grammy's summer garden. She loved Freesias, Fiddlenecks, and Bleeding Hearts. Seeing any of those flowers always reminds me of early childhood and summer days spent in her garden. I wanted to do something CAS but with a fancy die cut frame so I'm not sure this really is a CAS design but it certainly isn't over-the-top with embellies and froo-froo. I colored the image with my ProMarkers and had to do a little finagling with the frame die. 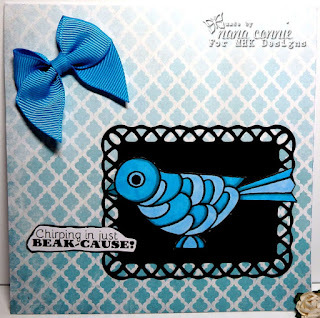 It's by Cheery Lynn but it's a rectangular die and the image is square. I cut the frame from white CS and then cut a piece out of each side to make it into a square. I added the flowers at the point on each side where the top and bottom halves of the frame meet. I colored the frame with watercolors, trying for an ombre effect but I couldn't get the top part of the frame pale enough so I'm not sure it really worked. IRL, it's still very lovely and there is a delightful mix of purple shades. The background is completely glittered and I also glittered the little punched butterfly on the right hand side. I added the bow at the bottom because it needed something to draw the eye down and anchor it. It seems strange to think of Marilyn Monroe as anything but a thirty-something person but, had she lived, she would be 90 years old this year! Her death was 54 years ago last Friday and she's still an icon of the silver screen. As a tribute, this image by The East Wind came with their monthly newsletter and is called, appropriately enough, Aurora "Marilyn." and colors that came from House That Stamps Built. I colored with my ProMarkers, then cut and corner punched the image. I matted it with black dp which does have a print in it but it's rather faint and difficult to see. Again, I punched the corners. I added a polka dot background and then dug out my Memory Box dies. I cut gray butterflies, then pink vines and flowers, stacking layers of flower petals to make the two larger flowers which are adhered on top of the black ribbon. I added sparkly gems, scattering them across the image and the die cuts. After all, Marilyn did believe that "Diamonds are a Girl's Best Friend!"